The royal baby special… on stands before the royal baby was born. 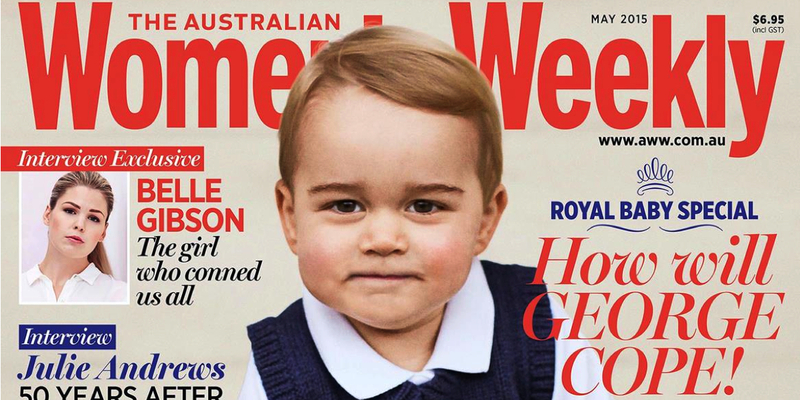 Nevertheless, the Weekly dives keenly into the archives, covering the May issue with a chubby-cheeked Prince George of Cambridge. The Juliet Rieden eight-page spread has snaps from when George was first born, eight facts about him including his love of painting and Prince Harry’s need to wait until his return to the UK to meet his newest niece or nephew. Further into the magazine, royal fanatics can also find a pattern for stitching the vest he’s wearing on the cover. We can’t help but wonder who will be on the cover of the June issue? Elsewhere in the mag, Caroline Overington travels to New York to speak to Julie Andrews on The Sound of Music’s 50th anniversary ahead of her 80th birthday in October. The Weekly also has an exclusive interview with Belle Gibson, the founder of The Whole Pantry who falsely claimed to have cured her (non-existent) cancer by eating wholefoods. 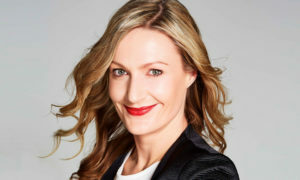 Clair Weaver speaks to Gibson in an seven-page spread called “My life-long struggle with the truth”, which has attracted considerable media attention. Patty Huntington looks at French legislation outlawing extremely thin models, and questions whether these laws have a place in Australia. Weaver has another great by-line in this months issue, on a story examining exactly why surgery has become a boys’ club and the impact this has on female surgeons. In a Mother’s Day special, Dame Marie Bashir, Dame Quentin Bryce, Lisa Wilkinson, Kathryn North and Sarah Murdoch all talk about the charitable work of the late Dame Elizabeth Murdoch, and their intentions to continue her work. 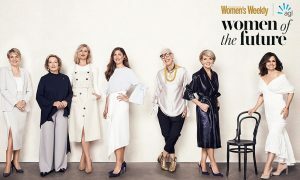 The first 10 of Australia’s 20 most stylish women are showcased over an eight-page spread, while women 10-20 are relegated to a two-page spread on page 208. Cate Blanchett, Lee Lin Chin and Crown Princess Mary all make the top 10 cut. There’s also a six-page spread of Daryl Hannah in which she reveals her struggles with autism and anxiety. The best autumn jackets are showcased in a five-page spread, while the 36 buys for winter selected by Rebecca Rac has definitely got a 70’s twist. Erin Molan and her sister Sarah talk about Sarah’s diagnosis with bowel cancer over three pages in the health section, which also takes a look at dementia. Julie Goodwin puts on a Mother’s Day spread including cupcakes and scones (and Bauer’s Food to Love gets a plug too), while Margaret Fulton’s favourites also puts up some great-looking treats including a New York cheesecake and pea and ham soup. Pretty good value for under $7. 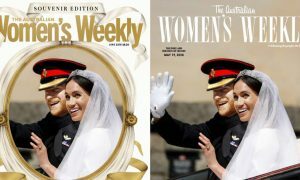 Digital: The new-look Women’s Weekly website is frequently updated with stories from the mag and digital-only offerings. On Facebook, the mag has 273,583 fans and 12,700 Twitter followers. EIC @helenmccabe proves more popular than her title, with 21,900 followers. Digital subscriptions are available for one month ($4.99), six months ($21.99) and one year ($39.99). AWW Cookbooks are also available in digital copies, with monthly subscriptions available for $9.49.